I'm not finding a discussion group of Basilisk II running on SDL layer. Anyone find a newer one? Well after major pain in the A$$, got it working. 1.) The problem with the above version is the cursor alignment is way off, couldn't calibrate correctly. So it seems that clicking doesn't respond, problem is touch calibration is off,. Hint, use Bluetooth mouse. 2.) Also , only after a successful launch does it save the configuration settings. Using a Bluetooth mouse, I recommend these settings. Network tab - Internet (slirp) Not sure about this one, can't get internet working. Now trying to figure out how to use Basilisk II , meaning have to force close after shutting down MAC because don't know the hot keys. Good to know you got things rolling on your droid. The variable cursor offset is done on purpose, not to cover things with your huge fingers. MacOS 8.1 is the last OS to support a Motorola 680X0 (emulated) cpu. A BT mouse, though a good thought, is not practicable with hand held devices. I usually do configure a volume button as (left) mouse button via the SDL config to get my mouse clicks respond as they should. The Basilisk config file may easily be edited with a text editor of your choice to use e.g. screen sizes not available in the GUI. Man, great to hear from you.. Thanks.. Does internet work via phone? It's more of a novelty, since Ubuntu as Desktop is much better using phone. Hm, yes internet does work with Basilisk II. If you enable slirp in the Basilisk II GUI and set TCP/IP to Ethernet and DHCP you may connect to some server. There is no even half recent browser for 68k Macs. Even if you can find a HTTP page, it will look very strange compared to what it should look like. HTTPS was not there when we used the old Macs, so no app from yonder will know how to handle that. FTP should work, but many such servers were moved into a HTTPS container, afaik. 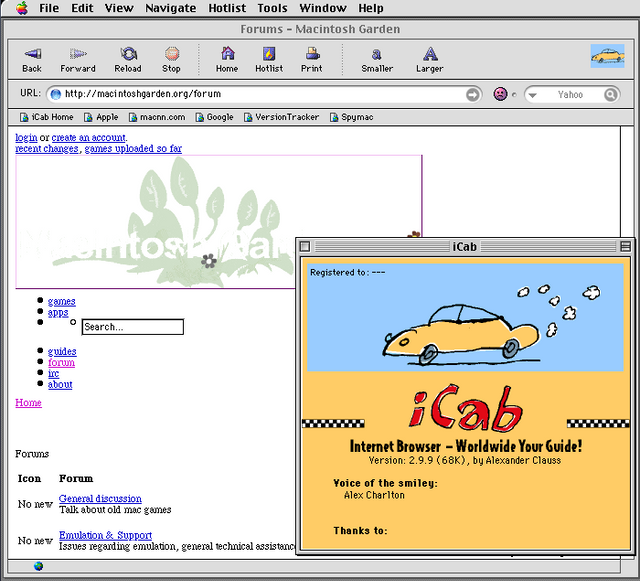 Guess you get the idea, why WWW is not really recommendable with MacOS 8.1. A text only browser may be worth a thought, if you are content with that. You might set up a Hotline client instead too to connect to a server. Sorry to tell that the Android build of Basilisk II does not seem to connect as in the example above. Its a known issue, that some features do not work as expected with Basilisk II Android. Not sure whether its a build issue or a problem with my tablet, though. Forgot about a discussion in 2016 over at Macintoshgarden. 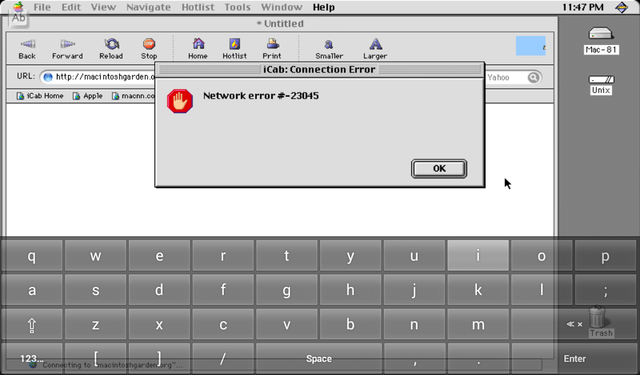 User m68k also reported that Basilisk II Android did not connect to a network via TCP/IP with SLIRP enabled. We may conclude the Android build is incomplete regarding network, methinks.